I’m the seeing-eye person for my little blind dog. I tap my foot to indicate the spot where I’ve dropped Cricket’s treat. I gently tug her head up by the leash so she doesn’t bump her nose on the curb. I squeak her toy before the toss so she knows how to track it. I never rearrange our furniture. Cricket wasn’t born blind, but juvenile cataracts took her eyesight at the young age of two. She’s eleven years old now, and, like most pet owners, we adore our fur-baby. As such, my husband and I spared no expense. Cataract surgery on both eyes; laser surgery to save one detaching retina; pricey drops to keep glaucoma under control. Cricket is high maintenance! 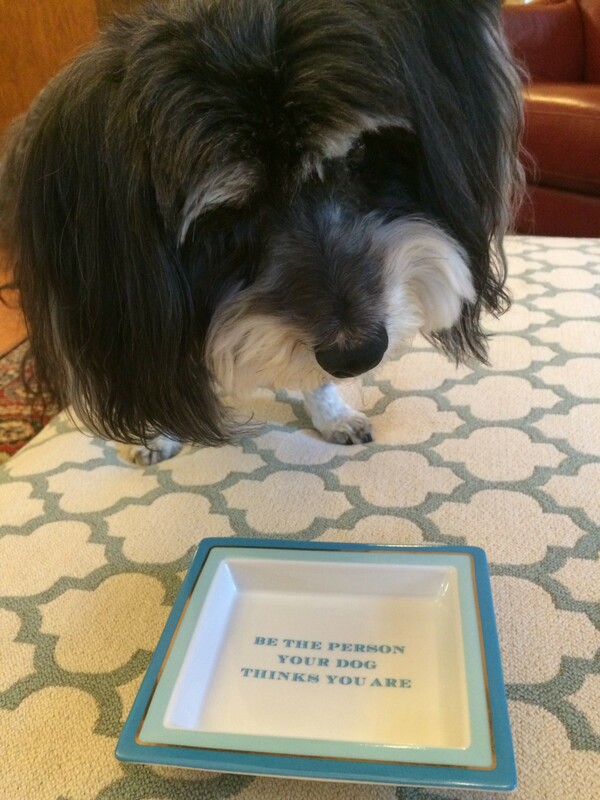 Perhaps you’ve heard the funny saying, “Be the person your dog thinks you are.” I have a ceramic dish that displays the quote, and it got me thinking. What kind of person does Cricket believe I am? #1 – My dog thinks I’m a caretaker. I provide for all of Cricket’s needs. I feed her, pet her, bathe her, walk her, and administer her medications. I make sure she doesn’t bump into things. I keep her safe. So, according to my ceramic dish, I need to BE this person, right? That means I should take care of myself. My husband, colleagues, friends and family will treat me the way I treat myself. I recently heard Elizabeth Gilbert, best-selling author of Eat, Pray, Love, explain her thoughts on this topic. She says that after years of self-work, she finally blossomed into a person who could attract positive results. She learned how to treat herself so well that she finally recognized what it felt like to be treated well by others. I need to take care of myself as well as I take care of sweet Cricket. #2 – My dog thinks I’m the alpha. Cricket knows I’m the boss. She can’t help it. It’s instinctive. She hangs her head if she thinks I’m upset with her. She rolls onto her back to get my attention. She stays in place when I tell her not to move. If I’m going to BE this person, I need to be the alpha of my own life. If I don’t take charge, someone else will. As William Ernest Henley wrote in his poem, Invictus, “I am the master of my fate; I am the captain of my soul.” Every day is a new opportunity to focus on my goals. I have to be my own alpha. #3 – My dog thinks I’m active. Twice a day, I lead Cricket on her walks. I toss toys to her. I brush her fur. I help her chase a soccer ball around the yard. To BE the person Cricket thinks I am, I need to stay active. I lost a smart, vibrant, beautiful college friend this year to cancer. I think if she were alive, she’d say, “Lethargy has no place in your life, Cathey. Go live!” I need to actively live until the day I die. Cricket cannot see the toys I toss, but she enjoys fetching them as if it were the most exciting event she has ever encountered. Just as Cricket adapted to her blindness with her frisky personality still intact, I, too, want to face each day’s challenges with active enthusiasm and energy. #4 – My dog thinks I’m cuddly. Cricket sleeps in the bed with my husband, Kevin, and me. She cuddles with us, especially during thunderstorms. I translate this to mean that I should be soft (cuddly! ), not harsh. Karma means that there’s a law of attraction at play in my life. I want to be supportive and encouraging of the successes of my friends. I want to think positive thoughts; listen to my intuition; visualize how I want my life to be. That prickly old feeling of disappointment is the opposite of cuddly, so I strive to not wallow in discontent. #5 – My dog thinks I’m part of the pack. Cricket does a pretty typical dog thing, or maybe it stems from her breed (Havanese!). No matter who walks in our door, she barks—even if she knows the person quite well. When our son, Will, comes home from school, Cricket barks. When Kevin gets home from work, she barks. When our older college kids visit, she barks. I guess she’s warning me that our other pack members have arrived. But, interestingly, whenever I enter the house, she doesn’t bark. I love that she’s silent upon my arrival, because it makes me feel that I belong here. I like being an integral part of the pack. I think in other areas of my life, I need to be a bigger slice of the pack. A member of the author pack. A member of the publishing pack. A member of my pack of awesome girlfriends. It’s a creative world, and I want to be part of it. Please forgive the awkward photo of Cricket. Because she can’t see, she was confused about what I was doing with the dish! I am so proud of my creative, energetic, self-caring, soft daughter! I am glad to be part of your pack. Thanks, Mom, Oh Pack Leader.